Submitted photo Jennifer Rosengarten, who received her bachelor’s degree in painting from Wright State, was commissioned to create paintings for Miami Valley Hospital South. FAIRBORN — The greens and blues of nature have come alive on the walls of Miami Valley Hospital South. Three large, pond-inspired paintings by Wright State University alumna Jennifer Rosengarten hang high in the atrium of the hospital’s Joint and Spine Center, a new treatment facility at the hospital’s campus in Centerville. Rosengarten should know. Her art has also been displayed at hospitals and corporations in New York City, Cincinnati, Houston and even Costa Rica. She also recently had exhibitions at the Springfield Museum of Art and Art Access in the Columbus suburb of Bexley. Her latest installation at the hospital spine center, which features sports medicine, sports performance, pain center services and chiropractic medicine, was unveiled during a Nov. 27 ceremony. It consists of three large paintings inspired by ponds and floating aquatic lotus flowers. Rosengarten grew up in Beavercreek and remembers getting her first set of oil paints when she was in first grade. She also remembers being mesmerized by a reproduction of Van Gogh’s sunflower painting that hung on the kitchen wall. “I used to just stare at that,” she said. When Rosengarten enrolled at Wright State, she declared economics as her major. But that quickly changed after she took a drawing class and won a scholarship that led to her bachelor’s degree in painting in 1989. Rosengarten said Wright State was hugely influential and gave her a solid grounding in drawing, painting, color and techniques. After graduation, Rosengarten worked on her portfolio, won a scholarship to Boston University and in 1993 earned her master’s degree in painting. She later lived in Providence, Rhode Island, before moving to Taos, New Mexico, where she resided for three years. But Rosengarten was lured back to Ohio by its green and vibrant landscapes. Over the next 12 years, she taught painting and drawing, mostly at the University of Dayton. She recently transformed her garage into a studio that enables her to create large paintings. Rosengarten was introduced to the Miami Valley Hospital South project as a member of The Contemporary Dayton (Visual Arts Center). A donor selected and sponsored her work. To meet the deadline, Rosengarten worked on the three paintings 12 to 15 hours a day seven days a week. She finished them in 10 weeks. Rosengarten wants hospital patients and visitors to be enveloped by the paintings and to be moved by the sense of color, light, movement and peace. She says the art looks much different now than it did in her garage studio. 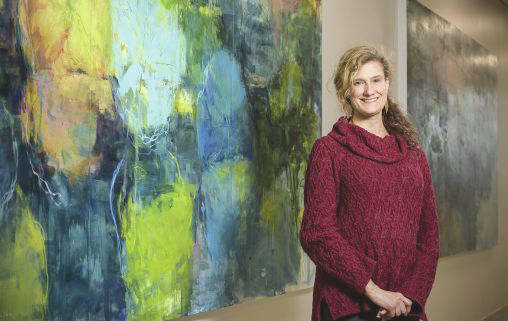 https://www.fairborndailyherald.com/wp-content/uploads/sites/50/2019/03/web1_jennifer-rosengarten-20827_021-508×321.jpgSubmitted photo Jennifer Rosengarten, who received her bachelor’s degree in painting from Wright State, was commissioned to create paintings for Miami Valley Hospital South.